Kwanzaa was introduced as the first specifically African-American holiday in 1965 by Maulana Karenga. He wanted African-American to have an opportunity to celebrate themselves and their history instead of imitation of participation of the dominant society. Kwanzaa has its roots in the movement of the 1960s, when African-Americans wanted to reconnect with their African cultural and historical heritage. This celebration has got seven major principles which are, according to Karenga, a communitarian African philosophy: unity, self-determination, collective work and responsibility, cooperative economics, purpose, creativity and faith. Kwanzaa has got its own symbols which include a decorative mat with other symbols laid upon: corn and crops, candle holder, communal cap, gifts, a poster of all seven principles and also black, red and green flag. All the symbols are designed to convey the seven principles of Kwanzaa. 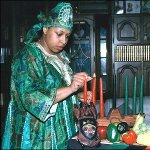 Many African-Americans who celebrate Kwanzaa observe it as ad additional celebration to Christmas.